It is 4 am and the scanner in our bedroom goes off for the second time this cold snowy night. My husband, Dave, jumps out of bed and quickly drives down to the firehouse to meet the other first responders. This call is for an automobile off the road on Palmer Hill, unknown injuries. An earlier call came from a woman who fell and needed assistance. The dedicated men and women who volunteer for the Andes Fire, EMS and Auxiliary are on call 365 days a year 24/7. Many of these men and women have been volunteering for over 40 years. Calls come in at all hours for activated fire or smoke detectors, homes and barns on fire, tree branches down on icy back roads, missing hikers or boaters, people with chest pains or difficulty breathing, the list goes on and on. 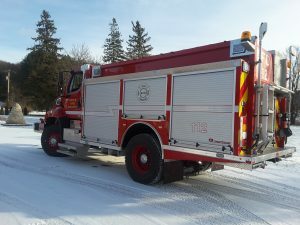 So it was with much anticipation that the Fire Department took delivery of a 2016 Freightliner fire truck, replacing two 30 year old vehicles. Fire chief Dale Tait and assistant chief John Ruchar made the trip to South Dakota in November to inspect the truck and go over final details. The Fire Department and EMS are funded by your tax dollars, fund raisers, and donations. It has taken many years of saving to be able to purchase this state-of-the-art vehicle. The truck is four-wheel drive, holds 500 gallons of water and pumps 1,250 gallons a minute. It has three different size hoses, each 650 feet long. 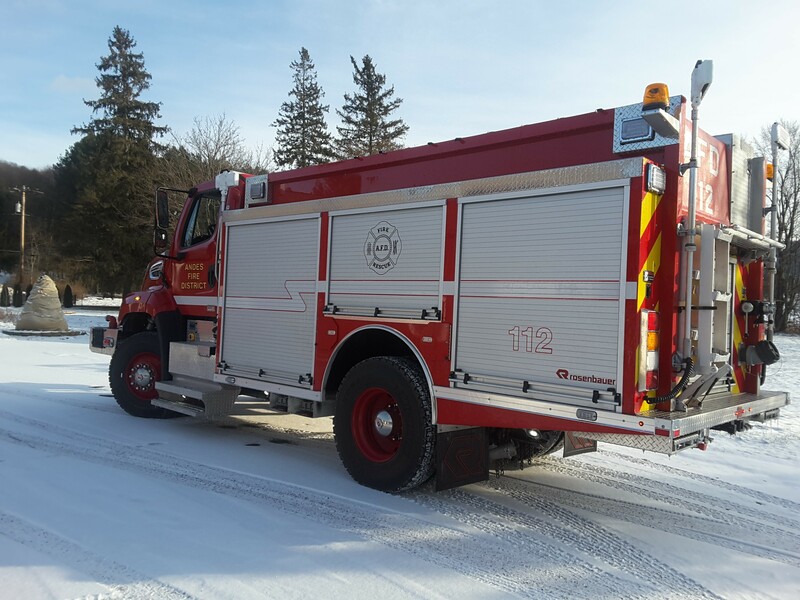 With its wide array of emergency equipment, truck #112 will respond to most emergency calls in our district. You will recognize this vehicle by the Mountaineer logo proudly displayed on the rear. (See photo at left) The logo was chosen by the Andes elementary school students during a visit to the firehouse during Fire Prevention Week. Earlier this year the Fire Department also took delivery of a 2015 Chevy 2500 Crew Cab pickup truck through state bid. This truck is the chief’s utility truck. 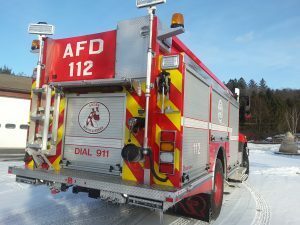 It has a variety of small emergency equipment and will be used, as required, to tow equipment to an emergency scene, get manpower to emergency sites, and for transportation to training, meetings and parades.